Either print off and complete the questions or read on your computer and answer on a separate piece of paper (feel free to type and email me the completed work as well:). On the last page you only have to choose one of the four extension activities. Don't forget to read 30 minutes today in your AR book. 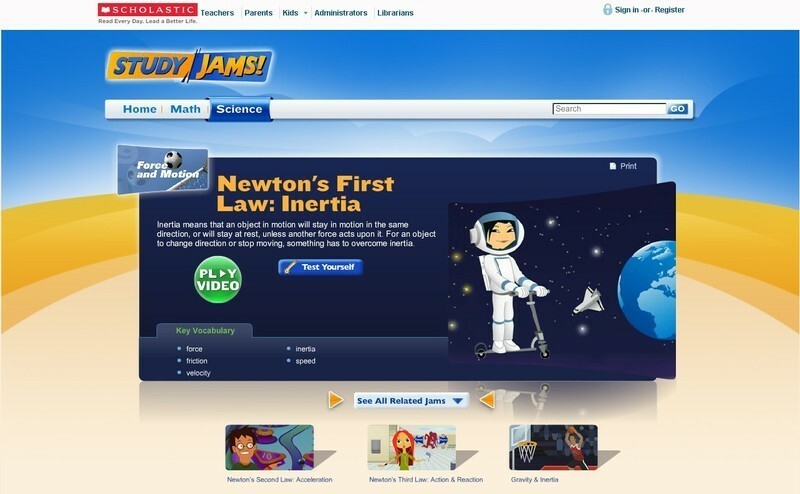 View the StudyJams video, "Newton's First Law: Inertia". After viewing, take the online test, by clicking the "Test Yourself" button. Write your name and homeroom at the top. Write the title of the video you just watched (e.g., "Inertia"). Next to the title, write your test score. "Newton's Third Law: Action & Reaction". On our next school day, turn in your StudyJams paper to Mr. H. Be prepared to discuss your new knowledge in class. Find and click on Portugal, then on Spain, both of which are European countries from which explorers came to the New World during the Age of Exploration. Click through the red links under the country's name (see image below): Sightseeing Guide, History Timeline, Native Lingo, Challenge, Day in the Life and read the information presented. Print out the worksheet below, complete it using the information you just read, and turn it in on our next day at school.